Two semiconductor heavyweights enter the ring, one chip titan leaves. Well, sort of. 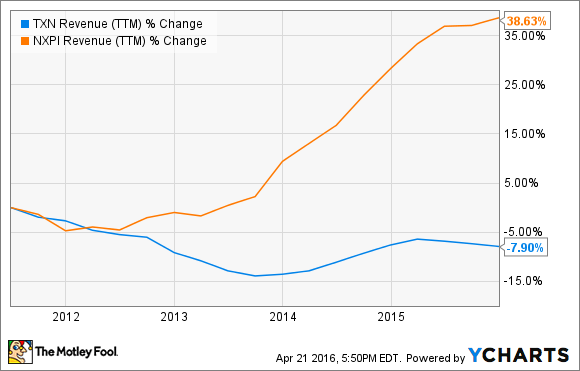 Texas Instruments (NASDAQ:TXN) and NXP Semiconductors (NASDAQ:NXPI) have a lot in common. Both of these large-cap semiconductor veterans run on a flexible mixture of in-house and third-party manufacturing lines, a rarity in today's increasingly fabless chip sector. They target similar end markets, such as automotive computing and the Internet of Things. And both run a very tight ship, with industry-leading operating margins and returns on equity. For all their similarities, they also stand apart in many ways. Which one is the better investment today? Let's dig deeper to find out. Alright, you know they do things big in Texas. TI boasts twice the annual revenues and three times the free cash flows of its Netherlands-based rival. If you're looking for economies of scale, there's really no competition here. Don't accuse me of cherry-picking numbers here -- the parade goes on for miles. TI's cash balance is also twice the size of NXP's, while NXP has more than twice TI's debt load. EBITDA earnings? Advantage Texas Instruments, by a tree-to-one margin. Honestly, TI wins every size-based comparison. Texas Instruments has been making microchips since the semiconductor was invented, and has some 40,000 technology patents to its name. It's a household name of global proportions, and for good reason. This epic scale brings stability to TI's operations. If the world were to end tomorrow, this company would keep running until 2018. In short, Texas Instruments isn't going away anytime soon. You can buy this stock, and sleep well for decades. Meanwhile, you get to cash in a 2.6% dividend yield. Between dividend checks and net share buybacks, TI returned 87% of its trailing free cash flows directly to investors. Yessir, that's a shareholder-friendly policy if I ever saw one. This car and the drone above are talking to each other via NXP chips. Image source: NXP. The Dutch company is smaller, but growing at a much faster clip. During the last five years, NXP showed fantastic revenue growth thanks to a well-placed product portfolio. The company's secure communications products, including near-field communications chips, rose 32% in 2013 alone. When that segment started cooling down, in-car computing picked up the baton, and kept on sprinting. Automotive solutions sales rose 20% year over year in the most-recent quarterly report, and that's before accounting for the just-closed merger with Freescale, which was an established leader in that particular market. 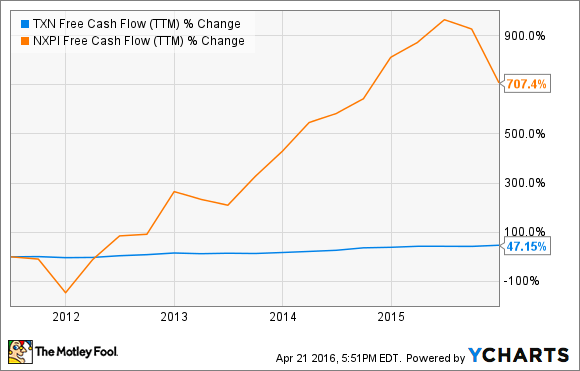 TXN Free Cash Flow (TTM) data by YCharts. 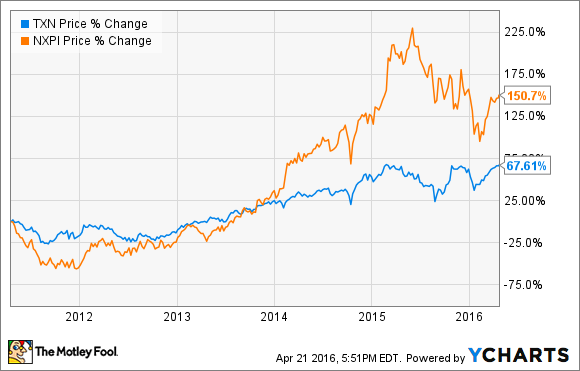 Which one of these chip stocks belongs in your portfolio? As I'm sure you've figured out by now, it depends. In a way, it's hard to go wrong here. Again, TI and NXP have similar operating models, both leaving most of the industry far behind in terms of efficiency. They are latching on to promising growth markets like the Internet of Things and automotive computing in a big way. Both have also recently digested very large acquisitions -- National Semiconductor in TI's case, Freescale for NXP -- that only brought them deeper into the same potential growth markets. These are two high-quality businesses. But as shown above, TI should appeal more to investors craving income and stability. NXP is growing faster, but with great growth comes high execution risk. That's the obvious choice for risk-friendly investors hoping for larger share price returns, but ready to tackle some bumps in the road.